Writer-director Imtiaz Ali’s great strength is his ability to relate emotional truth. His characters act the way that regular people do, not the way that movie characters are supposed to. Highway is the fullest realization of Ali’s gift for conveying truth. It often feels more like a documentary than a work of fiction. It’s an astounding accomplishment. Smart directorial choices heighten the sense of immersion in the main plot. Past events and scenes not featuring the movie’s main character, Veera (Alia Bhatt), are primarily shown within a frame, while current events take up the whole screen. The film begins with un-subtitled footage of preparations for Veera’s wedding, shown within a black frame. Veera doesn’t look particularly happy in any of the footage. The image fills up the whole screen in order to show Veera sneaking out of her house to meet her betrothed, Vinay (Arjun Malhotra), who’s not pleased to act as Veera’s chauffeur on a nighttime jaunt. She says she feels stifled in the bustling house and wants to run away. He would rather get home as soon as possible. The couple stumbles into a robbery at a gas station, and Veera is taken hostage by a gang of petty thieves led by Mahabir (Randeep Hooda). Only once they’ve made their escape do the thieves realize they’ve captured a rich man’s daughter, and they’re not happy about it. They know that Veera’s father will use all of his substantial resources to find her, so they hit the road with Veera in tow. Veera’s initial fear gives way to fascination as she sees parts of India that she never knew existed. It occurs to her that, even though she’s vacationed all over the world, she’s never seen anything outside of her hotel. It cannot be overstated how brilliant Alia Bhatt is as Veera. So much is demanded from her — from expressing childlike wonder to terror to heartbreak — and she excels at every turn. A simple scene in which Veera laughs with delight at the sight of a roaring mountain river is impeccable. Hooda is perfectly cast as Mahabir, who winds up growing nearly as much as his young captive does. Gruff and taciturn by nature, Mahabir slowly allows Veera to coax vague information about his troubled past out him, forming a bond with her that he wishes didn’t exist. Mahabir’s gang is freer than their leader is in expressing their amusement with their charge. One of the goons — Aadoo (Durgesh Kumar) — is particularly charming, staring at Veera with the same wide-eyed fascination with which she regards nearly everything she sees. 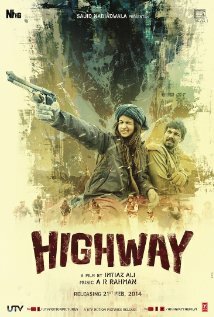 So much about Highway is beautiful: the performances, the mountain scenery, A.R. Rahman’s gorgeous score. There are a number of times when not much seems to happen, but those are some of the best moments. Ali allows the audience time to breathe and soak in the atmosphere he’s created. It’s a wonderful experience. This entry was posted in Reviews and tagged 2014, 4 Stars, A. R. Rahman, Alia Bhatt, Arjun Malhotra, Bollywood, Durgesh Kumar, Highway, Hindi, Imtiaz Ali, Indian, Movie Review, Randeep Hooda on February 21, 2014 by Kathy. Lovely review. I was damn sure you will like it lot. Whereas it seems that Indian critics have lost the sense of what cinema is. Thanks, mayanknailwal! Mainstream American critics have been harsh on it, too. Imtiaz fulfilled my expectations at par level. I already have watched it twice. Wow….one would not like to miss it then! Hey, I saw your tweet yesterday and watched the movie today. Pretty much feel the same way about the movie as you do! Wonderful…. Alia Bhatt’s performance was brilliant… the visuals were stunning and AR Rehman’s music was good as usual. A fresh Hindi movie after a long time! Waiting for Shadi Ke Side Effects now! Just watched highway and I’m totally blown away. Be it the great scenery, himalaya, music and above all Aalia’s and randeep’s performances. This movie excels in everything. But the greatest is hat itsit’s honest. Story is honest. Characters are honest, honest to themselvest and need not to the society. I could connect to veera at every level, be it the anger of sexual abuse or journey of half of india. I was seeing myself in her. I too had spent time just watching the roaring river when the first time I saw it. Saw Liam Neeson’s ‘Non-Stop”, was a very good movie. I wish Salman Khan should pick up scripts like this? Non-Stop, Taken (1&2), The Grey and many more. I wonder when & if that will happen!? I’d love to see that, too, Nav. I wish Sanjay Dutt’s Kidnap had been a better movie, since it has kind of a Liam Neeson-type of plot. Maybe it could have started a trend. Just saw highway..it’s very good. … Kathy your review is bang on!